Hello users! I am absolultely in love with this program. I play with this as a hobby (not a profession). I been using this for nearly a year! So far I have noticed these things on my wishlist could come extremely handy. I apologize to developers who may be overloaded with this large list of mine. I noticed that they have the floor one done. However, I do wish that they could make the top of the wall option as well. 2. Guide to average sizes of utilites? I feel that it would be an excellent use to the users to know default sizes of anything they put into their house. What you think? I would enjoy the option of creating a floor with a chosen side to have railing. It becomes handy for lofts, balconies, and decks. I'm not really sure how else to explain this. But I want this option badly as well. Including it into a automatic roofing generator would be excellent as well. For some of your ideas there are workarounds (think importing elements as staircases to punch and reshape ceilings and make glass floors, like SF 3D models 308 and so on). 2. Guide to average sizes of utilites? I feel that it would be an excellent use to the users to know default sizes of anything they put into their house. What you think? Finding out correct sizes really does take a lot of time. Annoyingly, dimensions are not that standardised and vary from country to country. For instance, kitchen cabinets are often produced in 40-60-80 cm widths in Europe, similar in the US, but usually in whole inches which means they are not interchangeable. Or to take doors. When ordering from my local dealer, you should specify interior door size by the wall opening, so the actual door is smaller. Door sizes in Europe often (but not always) come in these flavours. The square brackets contain rule-of-the-thumb formulas for calculating each step so it matches a comfortable pace (step). Useful link, showing that the standardized round numbers are similar in Europe and the US, but not the same. And there are some pitfalls when fitting a kitchen. In the US, apparently, the similar base cabinet would be 24" (60,96 cm) deep and so on. In short, a model found online could be similar, but not accurate. Dishwashers, sinks, cooktops etc. are usually sized to fit inside standardised elements. Worktops here usually come in 60-63 cm depths, wall cabinets some 30 to 40 cm deep in different heights. More important, there are minimum safety requirements for the distance between the cooktop and wall cabinet / extractor hood (which means it may be impossible to use the tallest wall-cabinets if ceiling space is insufficient). However, these standards must be taken with a pinch of salt as many suppliers use non-standard dimensions. One local supplier uses worktops/base cabinet depth of 75 for more work-space/storage; another supplier uses 50 cm depth for more floor-space in confined spaces. Also, an international, Scandinavian supplier of kitchens, uses different dimensions in the US and Europe. Brits who visit the US site to get inches, may find that the local store will deliver different dimensions for their kitchen elements. As a couple of mm can make the difference between a perfect fit and lots of extra construction, it is worthwhile doing an extra check to get accurate measurements for SH3D elements. And this is especially important when combining kitchen elements from different suppliers, such as a nice work-top from one and base cabinets from another. 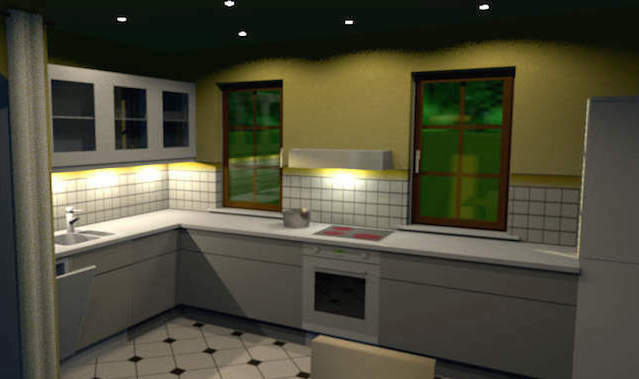 SH3D is extremely useful for kitchen decoration (and more useful than some of the kitchen planners on suppliers' websites) provided you can find the right models online. It can be a good idea first to size the kitchen elements correctly, use move with SHIFT-CTRL to place and then Furniture-Align side by side to get the correct fit. I also found another request that I would like. I noticed that adding the ceiling lights option tends to make the render for the windows work better. However, there is random black spots and random placements of the ceiling lights in the rooms. I would like to be able to re-arrange the lighting somehow. In other words, Under add ceiling lights there would be the button called Advanced Lighting Options? Ceiling lights are not placed randomly, but in the center of rooms. If you don't want them, just unselect the Add ceiling lights check box in the photo creation dialog box.